I went Colemak cold-turkey two days ago and I love it, I can clearly tell It's far superior to Qwerty! I've already reached 50wpm and can find myself around the Keyboard quite well. My biggest issue on Colemak is using Shift to capitalize letters, I've never used Homerow before and bringing my pinky down there feels quite awkward! So I thought why not try bring a use to my right thumb? Both my thumbs are resting on Space but I only use my left one! Splitting my Spacebar in half to turn the right side into Shift seemed like an amazing idea. If not could anyone give me some Keyboard suggestion that fits my need? I couldn't agree with you more! I have been saying this for ages: the shift keys in the default positions are not really fit for purpose. Although of course this isn't a uniquely Colemak issue. Using a thumb for shift is a much better idea. That's exactly what I have been doing for at least a couple of years now. 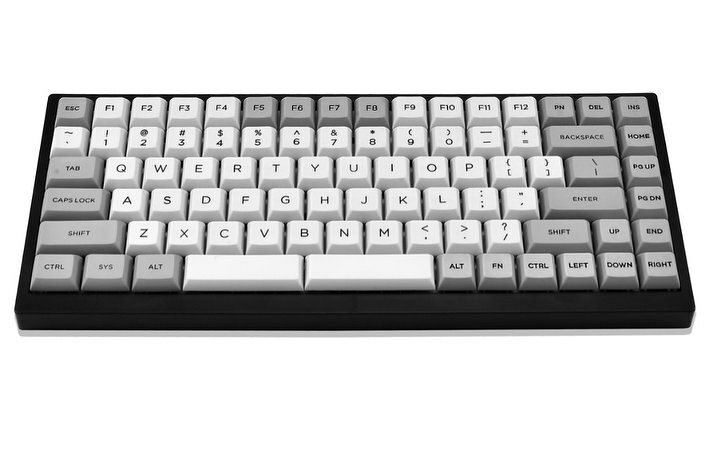 I have a Matias Ergo Pro, which has a split spacebar, and I recommend it if you are looking for a standard-ish keyboard but with thumb key options: the smaller spacebars and easier-to-access Alt keys give you a total of four comfortable thumb keys! The only downside is it's not properly programmable (left-space is by default mapped to backspace) so you have to hack it a bit to get what you want. But I can confirm thumb shift works well! In case you haven't come across it, I also wrote up this about using thumb key modifiers. Another option, if you don't want to get a split keyboard, is to use the Wide Mod, and then use AltGr (Right Alt) as your shift key. Some implementations give a dual role to the spacebar: a single press+release for Space, press+hold+someotherkey for Shift. I just read that SoS ("Space-or-Shift") isn't that uncommon in Japan. What do you know. I'm skeptical to it myself, but it seems to work for many. I tried space-or-shift for a bit. It didn't work for me, it caused to many errors, and is also cumbersome when you need a capital letter right after a space - which is quite common. Might work OK for oriental languages where there are fewer spaces, but IMO a dedicated shift thumb key is the only sensible option for western languages. Yeah I don't see Space/Shift working for me, would probably result in a lot of mistakes at higher WPMs! I've been looking around on Keyboards and it seems the only Keyboards that does what I'm looking for are custom made but they also seem to have removed half the Keys on the Keyboard which does not work for me at all, only thing I could consider removing is the Numpad. You don't need the arrow/special key block either, since you can use Extend. But I use the F# keys for Extend multimedia keys so I want those. Any key that's more than about a key-and-a-half distance from the home-row is too far away, especially for anything you need to access often. On a standard keyboard that means, backspace, delete, return, arrows, numpad are all not good enough. Fortunately, as DreymaR says, the perfect solution is at hand: Extend. Well I actually found what I was looking for so I figured I'd post if someone else were looking for something similar. The "Vortex Tab 75" seems perfect! But once you're getting special hardware, it's really quite unnecessary to keep the classic row stagger and you may be better off entering The Matrix...! Is it really customizeable though? What key codes do the Space bar send? Well I'm not using Angle/Curve mod so it's fine for me. Not sure what you mean by classic row stagger? I never really checked if It's customizable, from my understanding I can do that myself on the PC like with Colemak tho? I don't really ever leave my house so It's not an issue if It's less convenient than programmable keyboards. Beware, there exist some (poorly designed) keyboards that are split, yet both spacebars are hardcoded to emit the same scancode! Ohh that's good info, I'll look that up before buying thanks! On a matrix board, the rows aren't displaced from each other, but the columns may be on curvilinear boards! On a classic-stagger board, the lower and number rows are staggered 0.5 keys and the upper row a stupid 0.75 keys! This would be mostly okay... if the stagger didn't go against the natural angle of the left hand. Twisting the left hand to fit its home position causes ulnar deviation which is bad for you. The Angle and Curl(DH)Angle mods fix this, allowing straight wrists which is a lot more comfy. Split ergo boards do the same, more elegantly but at a cost. Since you're already contemplating spending money, you may be better off doing it properly and getting a split ergo matrix board? Check out the Colemak Discord Hardware channel, it's teeming with luscious boards and their enthusiasts.